There's no better way to bar crawl in New York City - whether it's for St. Patrick's Day, Cinco De Mayo, your birthday, or a random Friday night! You pick the bars and pubs. You pick the music. The trolley waits curbside while you stop. You don't even have to get off - the trolley is a mobile party lounge! Dancing onboard is encouraged. Tell us where to pick you up - apartment, hotel, bar, restaurant - and then you’re in charge. Tell the driver where you would like to go. We can go anywhere - Greenwich Village, the east side, Times Square, East Village, you name it. Use the trolley for your next literary pub crawl, craft cocktail tour, or bar hopping to the watering holes of your choice. Drinks, food, and decorations are welcome! Book our trolley for your next NYC pub crawl now! Hop-Off-And-On Service: hop-off and hop-on at any destinations within the NYC metro area. You choose your own NYC bar crawl route in the big apple. Capacity: 34 people each and the front half of each trolley has perimeter seating that faces each other creating a more social atmosphere. You can also stand in our trolleys as we have 9' ceilings. Check our interior photos on Our Trolleys page. Make any day a holiday: BYOB on the streets! 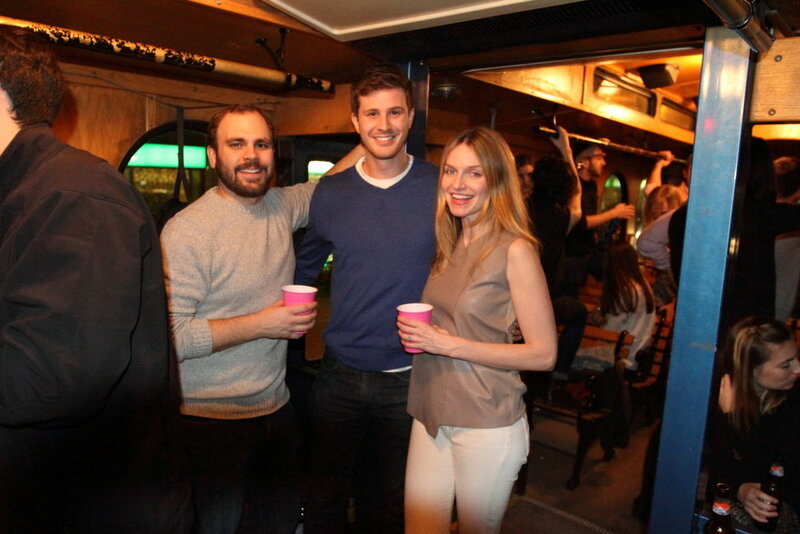 Our trolleys are perfect any night to get all your friends together for an impromptu bar crawl.